Manabu Orido, AKA Max Orido, joined the D1 Grand Prix as a competitor in the 2005 season. This famous GT500 class racer chose the Toyota Supra JZA80 as his weapon of choice. Using his expertise as a D1 judge for 3 years, and his acquired skill from professional driving, he is taking on the D1 series with a storm. The newest technology and tons of money have been poured into his drift machine. Orido aims at becoming the best at whatever he does! The platform he chose to challenge the D1 Grand Prix was the Toyota Supra. Orido chose this because he drives a Supra in the GT races as well as his personal car. Another reason is that there was hardly any or no Supras competing in the D1 circuit. He claims that "If I had chosen the S15 or FD3S as my drift car, it would be easy for everyone to compare me to the other contenders. The individuality of the Supra enables me to be myself". But there is a reason why people do not choose to drift the Supra. The front end weighs a ton and it is very hard to get traction on this machine. The suspension was designed to cruise at high speeds, not to toss around a race track. This car is known to be very difficult to drift with, especially at a D1 level. Nevertheless, Orido believed that he still had a good chance to win because of his background as a professional race car driver and as a D1 judge. The negative factors his machine is plagued with can be minimized by the great power the Supra holds, and also the flamboyant graphics will surely help him increase his popularity. Tsuchiya Engineering, who helped Orido in the GT races agreed to construct a roll cage and body modifications. Orido holds complete trust and confidence in Mr.Tsuchiya, who is a true race enthusiast who is currently gaining interest in D1 drifting. Neko Corporation constructed the suspension arms and the custom knuckles. Auto Produce Boss took the initiative to provide their services of complete maintenance and the engine work. The suspension settings were done by their main sponsor, RS-R. NATS, (Nihon Automobile College), a place where Orido taught at, did the body work as well. Orido first focused on making the vehicle lighter. Sure, no matter how much weight they shed, the Supra cannot compare to an AE86 or Silvia, but even a small bit helped in this situation. Carbon fiber doors and a rear hatch adopted from his GT machine was adopted, and all unnecessary metals were cut off. They had also aimed to be the number one in power output since Orido had to be the best in every field. The 680 horsepower output is currently number one, along with the wide fenders, and the wide rear wing. The wing surpassed the T&E Soarer' s wing, which was the widest wing in D1, by 5mm. The Supra equipped with the best suspension, relies on tire pressure to control traction! 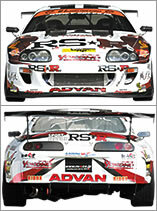 They began the construction of the Supra in the 2005 season, and the machine made its debut in the 2nd round. The body and suspension tuning was not up to par at the time, placing them in 8th. Here, Orido realized that the image he had of D1 racing was completely off. "I thought that if I had kept the car at its peak at all times like in the GT machines and just be able to control that power, I'll be alright. But during a tsuiso (chase) battle, I couldn' t adjust to my opponent at all, because my car was too fast" . This experience led the team to work with the vehicle setting. However, the Supra' s uneven weight distribution caused traction issues, which was impossible to fix. The vehicle was too light, causing a loss of traction. To counter this problem, the suspension was setup to increase traction. They had even tried methods of adding 20kg (44lbs) weights to the rear. The suspension arms produced by Neko Corporation were custom parts just for Orido' s Supra. This product enabled a wide range of adjustment, expanding the cornering abilities of the vehicle. The roll center was corrected according to the new arms that were installed, and the overall stance remains unchanged even during weight transfer. The adjustable arms allow an accurate alignment even after Orido crashes. However, due to the pure race bred suspension that was installed, the traction level became too high. To counter this, the air pressure in the tires was adjusted. This is the first thing the team performs during the D1 events, to change the tire pressure, followed by suspension/alignment adjustment. The tire pressure is one of the lowest amongst the rest of the D1 cars at 36.9 psi compared to a 56 psi setting at the Fuji Speedway. Now this Supra' s true potential is exposed to our loyal readers. The busy Orido cannot always take his time to tune the vehicle, especially the day before the events. There is no time to aid the small details. Orido' s driving is still improving nevertheless. The machine and the driver' s potential still have no limit. The 2006 season is going to be a tremendous year. D1' s most powerful engine at 3.4L 680 horsepower! The 3.0 liter displacement was used until the 3rd round. 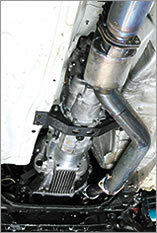 Until then, an idea of a 3S-Gt setup used in the GT machines were implemented, but decided to go with a stroked 3.4 liter setup. The T04Z turbine pushes 1.6 bar (22.8 psi) of boost, producing 680 horses. The SARD 3 core radiator is not enough for this setup, and a new cooling system is in the works. The power steering tank and the brake master cylinder tank could not be used since the strut tower bar was installed. The power steering tank was relocated, and the brake master cylinder was totally eliminated for the GT machine brake feeling. Fortunately, Orido was used to this type of brakes from his days of piloting the GT cars. An Infiniti Q45 throttle body replaced the electric throttle body, and was mated to the oversized intake manifold. A quick steer system was implemented by modifying the knuckles! Customizing the tie-rod and knuckles are necessary to gain more steering angle for drifting. At the same time, the quick steering feature was installed. The stock ball joints were replaced after a little mishap by Orido during practice of the 3rd round. The caster setting of the vehicle was adjusted with the arms, enabling more tread contact to the pavement when the steering wheel is turned. The rear diffuser provides tremendous down force. The purpose of the fins on both sides is to prevent over sliding when the car is drifting and also to redirect the tire smoke elsewhere. The round black assembly behind the suspension member in the rear are the 20kg (44lb) weights. The weight was installed as low as possible according to race theories. The suspension is a set from RS-R. The setting is relative to what is available to the public. The dampening force was lowered at the low speed range and increased at the high speed range. Most of the suspension arms were replaced with adjustable units except the rear lower arms. The LSD was set to withstand the initial torque at peak power. The sway bars remain stock but is planned to be replaced with RS-R units. A plethora of toggle switches brings out Orido' s adrenalin! The cockpit is filled with over 20 toggle switches, most of them a replacement for stock functions such as the power windows and windshield wipers. Only 5 switches serve a significant purpose. This was done at Orido' s request, to heighten his need for speed. The dashboard was constructed from carbon fiber and the main gauge cluster is from Max Racing. The toggle switch for the neon lights sits beside it. The steering wheel and the seats were custom made for Orido. The custom roll-cage was shaped like a pyramid. Tsuchiya Engineering fabricated this unit, to evenly distribute the points throughout the chassis. The pipes used for this roll cage were thinner than normal to save weight, yet protecting the driver at all times. Orido requested the seat position to be low like the GT machines, but was declined since Mr. Fujioka of Boss claimed that that would make the driver feel like there is more angle during drifting where there isn't. The pedals were converted to an organ type from that of a GT machine. The pedals were raised since the seat position was lowered. The heel component was raised 80mm higher than before. After the 5th round, the Getrag 6 speed transmission was ditched for a Holinger sequential unit. There was no problem with the Getrag' s strength, but an I pattern shifting was far better than the traditional H pattern. Adopted from a GT machine, the Ridox kit represents aerodynamics at its best! The entire body kit besides the wing (Sard) are RIDOX components which is produced by Orido himself. Each fender is about 40mm in width and the hood is the new 2006 model. The front and rear diffuser was inspired by his GT machine. The windows are all made of lexan.